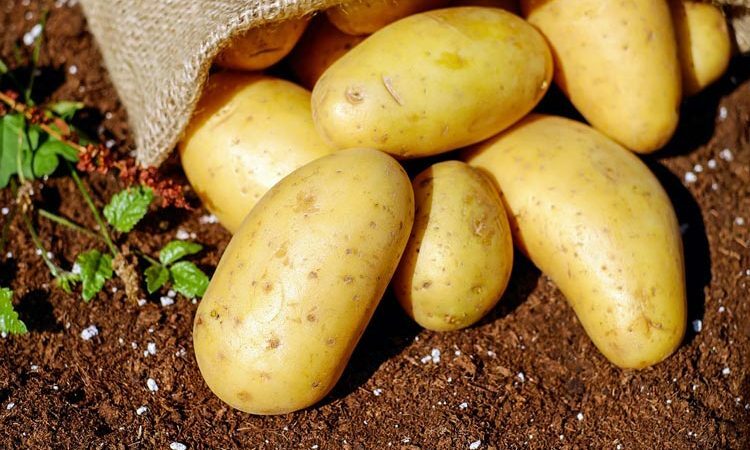 The principal requirements of the potato plant are adequate available food, sufficient water, good drainage and the type of soil in which tubers may swell easily. An open, unshaded site is very necessary. Light soils are considered very suitable, provided they have been dressed with large quantities of moisture-retaining organic matter. A heavy soil may also be improved structurally by the addition of organic material. A reasonably light, easily worked loam is probably the ideal. Where farmyard manure is available, it may be dug in during winter digging at the rate of up to 50kg (1cwt) to 6 sq m (6 sq yd). Garden compost may be applied even more generously during winter digging or as a mulch after planting. If a compound potato fertilizer is raked into the soil before planting, use it at the rates advised by the manufacturer. Potato plants are raised from seed tubers taken from plants which are free of virus-carrying aphids. The potato fields are visited by Ministry of Agriculture officials who issue certificates regarding the freedom from disease of the plants. Tubers from these plants are known as `Certified Seed’. It is unwise to plant any but certified seed tubers. 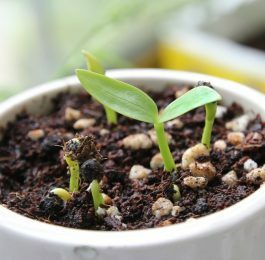 They should be purchased in January or February and sprouted in trays housed in a light but frost-proof room (a process known as `chitting’). It is believed that sprouted potatoes result in earlier crops. The gardener may also see which tubers have not sprouted and these are not planted. At planting time—in late March or April—each potato has two or three short, sturdy sprouts. The actual planting date depends on the condition of the soil and on the weather. There are many planting methods. Perhaps the simplest is to make 20cm (8in) deep trenches with the draw hoe or with the spade. First Earlies are planted at 30cm (12in) apart with 60cm (2ft) between rows. Other varieties need more space; 40cm (15in) between the tubers and 75cm (30in) between the rows are satisfactory distances. The black plastic method of growing potatoes is favored by many gardeners because it obviates almost all cultivation. The planting holes are made with the trowel. A tuber—with its sprouts uppermost—is set in each hole. The holes are then filled in and the black plastic sheeting is unrolled over the row. It is important to ensure that the sheeting is securely anchored into the soil. One way of doing this is to make slits with the spade on either side of the row and also at each end of the row. The edges of the 1m (3ft) wide sheet are tucked into the slits when the material is unrolled. When growth starts in May, the shoots of the potato plants are drawn through small holes (made with scissors) in the polythene sheeting. Rows not treated in this way need weeding now and then. Many gardeners earth up the plants, too. This process consists in drawing soil up and around the plants, using the draw hoe. Earthing up is done in two or three stages. Finally, the plants appear to be growing on low hills. Earthing up is no longer considered necessary but the practice is advantageous on heavy soils where the plants benefit from the improved drainage provided. There is only one way of ascertaining when First Earlies are ready for use. This is by examining a root. Scraping away some earth may reveal reasonably large tubers. If this fails, dig up a root in late June. If some of the potatoes are as large as a hen’s egg, continue digging the ground when required. If the potatoes are far too small for use, wait a several weeks before starting to dig.